Countries in breach of treaties or deemed otherwise out of favour can find themselves suffering sanctions from their economic partners, in the form of higher tariffs, extra trade barriers or asset freezes. Iran, North Korea and Russia have suffered this fate in recent years due to the illicit acquisition of nuclear capability or military aggression against neighbours. But no country has ever imposed economic sanctions on itself to my knowledge, which is what the United Kingdom will be doing if it crashes out of the EU without a deal next week. Theresa May has accepted that her monotone mantra of ''no deal is better than a bad deal'' was indeed the bluff it always appeared to be. Only the Brexit ultras still prefer a crash-out, and Mrs May has finally abandoned them in favour of seeking an agreement with Labour and another Article 50 extension. Substantial economic costs have already been imposed on the UK itself and on its EU partners, even if Brexit never goes ahead. Those costs will escalate rapidly if there is a crash-out next week, the default outcome unless the EU grants another Article 50 extension at the council meeting this Wednesday. This has now been sought and the UK can also unilaterally revoke its departure from the EU, courtesy of the European Court last December. Last Thursday's instalment of Carry On Voting, the Sid James revival at Westminster, showcased a substitute cast of older actors at the House of Lords. In the Commons, the final day's sitting of the week was suspended with the chamber closed due to water leakage: those Polish plumbers have their uses. In the Lords, which also absconded for the weekend after Thursday's exertions, Viscount Ridley, a Brexiteer, objected to legislation being rushed through in a single day. He was Matt Ridley in a previous incarnation, and chairman of the board at Northern Rock, the first UK bank to go bust during the crash. The Banking (Special Provisions) Act of February 2008 was rushed through in a single day to enable a taxpayer rescue, without objection from chairman Ridley. Another blast from the past, Lord (Nigel) Lawson, popped over from his French domicile to urge on the assembled eminences - one of whom slept through the proceedings - the attractions of instant separation from Europe. A couple of hours' watching the House of Lords on BBC Parliament makes the House of Commons look almost professional. Nothing enacted by the UK parliament in either chamber can offer anything beyond entertainment for the news channels. There is no escape hatch - there will either be a crash-out, another extension by grace and favour of the European Council, or a revocation. 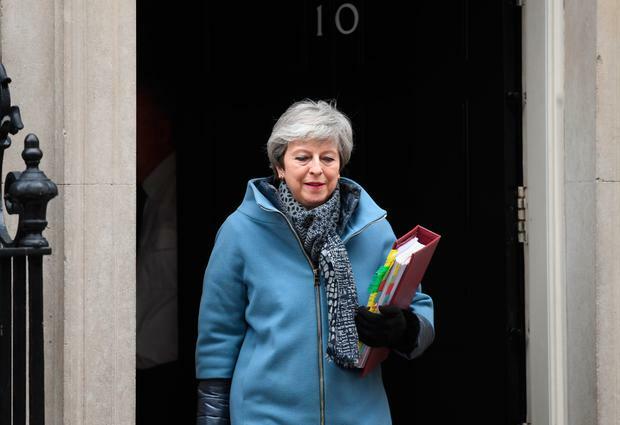 Another extension has been sought and could come with acceptance, finally, of Mrs May's thrice-rejected withdrawal agreement, or a commitment to a second referendum emerging from the cross-party talks. The UK parliament cannot vote away the no-deal risk unless the European Council, unanimously, perceives an adequate basis and the critical change these last few days is the willingness to organise participation in the European Parliament elections. The European Council will not offer an extension beyond May 22 unless the UK participates, and there finally appears to be a willingness to make the necessary arrangements. Non-participation will preclude an extension of EU membership beyond that date even if a withdrawal agreement is secured, while no withdrawal agreement means crash-out on April 12. The risk of a no-deal outcome rises with every day squandered in London (the referendum was 1,016 days ago) and border controls could become unavoidable, not just between Newry and Dundalk but at all other European sea and airports, which automatically become external frontiers between the EU's internal market and the third-country UK. Without an extension or a withdrawal agreement, and the standstill transition period to end 2020 that goes with it, the UK becomes a trading partner with no greater status than Brazil or Russia next Friday. At their meeting in Dublin, the Taoiseach and the German chancellor Angela Merkel reiterated their concern about the costs of a no-deal outcome. If border controls are introduced in a scramble (all over Europe, not just in Ireland), it will be the fault of neither Varadkar nor Merkel, neither of whom is a member of the House of Commons. The sub-text in statements from European leaders has been the avoidance of responsibility for a crash-out should the efforts to avoid no-deal end in failure. The preferred Brexiteer narrative is clear: a blameless and innocent United Kingdom is being victimised, expelled against its wishes despite its reasonable requirements, from a perfidious Europa and any negative fall-out is down to EU scheming, domestic traitors or the Irish. European Council president Donald Tusk has come up with a new formula that would see the UK, even in the absence of an alternative cross-party plan and without parliamentary consent to the withdrawal agreement, granted a year-long extension which would self-terminate whenever an agreement is reached. This would require European Parliament elections in the UK. Since Mrs May could fail to secure a deal with Labour, she could arrive in Brussels on Wednesday to be offered no other option. The Tusk formula infuriates Brexiteers, for whom crash-out holds no fears. Some believe that it saves the €39bn financial settlement, avoids the bothersome backstop for Northern Ireland and the need for tedious trade talks with the EU, releasing Britannia Unbound. At the European Parliament earlier last week, Commission president Jean Claude Juncker reminded members that "the United Kingdom will be affected more than the European Union because there is no such thing as a 'managed or negotiated no-deal' and there is no such thing as a 'no-deal transition'. And whatever happens, the United Kingdom will still be expected to address the three main separation issues". After a crash-out, the UK, with no arrangements in place for most of its external trade, would quickly seek negotiations and would need to pay its outstanding £39bn divorce bill, live up to the commitments on EU citizens in the UK and find a solution to avoid a hard border in Northern Ireland, according to Juncker. "No deal does not mean no commitments, and these three issues will not go away. They will be a strict condition to rebuild trust and to start talking on the way forward." Mrs May responded to Tusk's suggestion with a letter repeating her request, already refused, for an extension to June 30. When this is refused again, May can say she tried and was forced into the longer extension by the Brussels schemers. Jacob Rees-Mogg, the leading Brexiteer, responded to Tusk's olive branch with an unveiled threat: ''If a long extension leaves us stuck in the EU we should be as difficult as possible. We could veto any increase in the budget, obstruct the putative EU army and block Mr Macron's integrationist schemes.'' Such fun: as a member, Jacob, the UK can frustrate these dastardly foreign plotters forever. There could still be an early crash-out, but there could also be a slow glide to Remain. Did Samuel Beckett see it coming? "Vladimir: Well? Shall we go?